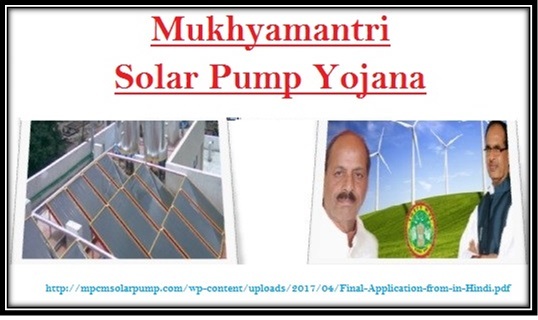 The Madhya Pradesh government has announced the Mukhyamantri Solar Pump Yojana to enable subsidy for farmers. For this scheme both the central government and the state government shall contribute. The Chief Minister of Madhya Pradesh launched this scheme recently and announced important details regarding this scheme. The basic idea of this scheme is to provide electricity – which is one of the main components of our daily lives. We know that electricity comes from natural resources, yet in many villages due to a scarcity of it, farmers suffer. Through the Solar Pump Yojana the government is calling for registrations for those who want a solar panel installed. It will be a onetime investment and it will help them get electricity throughout the year. To avail this subsidy you will have to fill out an online application (more on this later) after that you will have to follow some simple steps to complete the process. You will have to hurry because the dates have already begun. The government registrations began from 16th April and the last date complete the procedure is 15th May 2017. But before applying you must know if you are eligible for the same. You have to be a farmer of the state of Madhya Pradesh to be eligible for this scheme. Farmers from any other part of the country are not eligible. You must belong from a place where electricity has not come yet. Also, the place should have no possibility of having electricity installed in the coming 2 to 3 years. You must live at least 300 meters away from all electrical sources provided near you. If you are close to a water body and/or produce crops that need water, it will be an added plus. The place where you are applying from must need at least 1500 units of Horse Power to get the benefits. These places where distribution companies face heavy losses are the ones where these solar panels will be installed. If you live in a place where recently or sometime in the future the electricity distribution companies removed their towers because of facing heavy losses, you can apply for this scheme. The SC/ST farmers can get the maximum benefit from this scheme as they will be eligible for 5 hours free electric supply daily. They will also be entitled to get a grant in the form of subsidy from the government (up to 90 per cent). Other SubsidiesBoth the state government and the central government are investing in this project. This is why it is a big budget scheme with a large amount of subsidies to be exploited. Around Rs. 7900 crore shall be invested from the state government and out of this Rs. 76 crore shall be given as subsidy to the farmers. This amount will be granted one time during the installation phase only. According to this scheme, the benefits will only be granted to the farmers with farmlands. Also the farmland needs to be about 300 meters away from any source of electric supply. Irrigational land is the one type of area that will get the benefit under this scheme. Also if your land requires heavy water pumping daily, then this benefit shall be granted to you, given you fulfill the above criteria. The farmers will have to pay a sum of Rs. 14,000 only once for installing the apparatus. This amount will have to be paid by all farmers. Although they will receive the subsidies, you will also have to pay this amount at the time of installation, besides Rs. 5000 for application. Go to this website http://mpcmsolarpump.com/ you will see that the whole page is in Hindi so that you can better understand the options. You will see many links to different pages. Click on “आवेदन करें” at the bottom right corner of the screen. If you cannot see it, scroll the page down and it is right there at the right hand side of the webpage. You have to read all the options carefully and select the solar pump option that fits your needs and that you wish to apply for. You can choose only one. Now come down and select the type of land your farmland belongs to. This part is easy – you have to read and choose just one out of the options provided. Now scroll below and choose your mode of payment – demand draft, net banking, and cash. Enter the required details and scan the copies. Then below at “choose files” upload the scanned documents. “Submit” the file and you are done. But before submitting check all the details and see if you entered everything correctly. If you don’t want to apply online, you can also download the form and fill it up before submitting offline. To submit the form offline you will have to visit this link http://mpcmsolarpump.com/wp-content/uploads/2017/04/Final-Application-from-in-Hindi.pdf. This form, duly filled, is to be submitted to the district head along with Rs. 5000 in cash within 15th May 2017. If you want to take the benefits of SC/ST/OBC then you will have to submit your caste certificate at the time of application. The regular farmers who do not have the caste benefit may not need to add the same. People will be able to reduce their electricity bill. The government will also be able to incur the losses due to electricity distribution in those poverty stricken areas. The government will be able to reach more villages with electricity because of the ease of installment. Also, the carbon footprint will reduce per village, per person. It will be good for the environment. Plus, it will be a one-time investment for the farmers. After that they can enjoy solar power – which will also mean less frequent power cuts throughout the year for them.